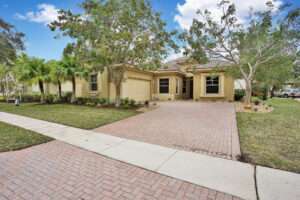 This beautiful home is on a large corner lot in award winning Heron Bay. There is a guarded gate and full amenities in this Golf Course Country Club Community with low HOA fees. The home is within close proximity to highways, restaurants, and shopping allowing easy commutes as well as A+ schools! It has breathtaking water and golf course views creating a rare, private, resort-like and tropical ambiance. 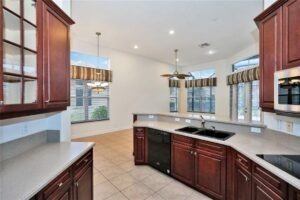 This stunning 5 bedroom, 3 bath, 2 car garage home has fresh new landscaping. It features a popular split floor plan. The large extended driveway runs adjacent to a cul-de-sac on a large corner lot. Screened in free flowing designer pool with beautiful doors and patio for dining or entertaining. Large kitchen with adjacent seating area or family room has french doors leading out to the patio. Adjacent to the bar area of the kitchen is a beautiful formal dining room with rich wood floors. Gorgeous entry with pillars and archways lead you into this magnificent home. The 5th room has rich custom wood built ins, perfect for your home office. 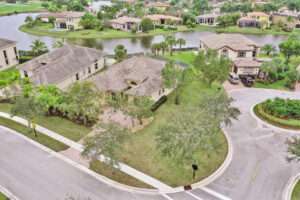 Large corner lot with water and golf course views.